THIS IS NOT A SCANNER. 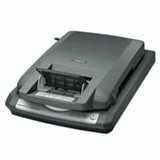 This is a feeder accessory for certain Epson scanners. Espon web site shows compatibility with Perfection 2480, Perfection 2580, Perfection 3490, & Perfection 3590 scanners. Scans a stack of up to 24 4" x 6" photos or business cards. (Scanner sold seperately). PLEASE CONFIRM COMPATIBILITY with your equipment before you order.